My Forged Wedding Story : A sudden proposal to enter a fake marriage. Pretending to be newlyweds started out as a dreadful task, but as you spend each day together, you slowly become drawn to his charm. Will what started as a lie turn out to be true love? Use the Hack to Unlock Season 1, Season 2 and the SubStory using iFunbox or iFile on your iPhone iPad iPod touch. My Forged Wedding cheat hack is Universal meaning it will work for any language, on any iDevice Jailbreak and No jailbreak. 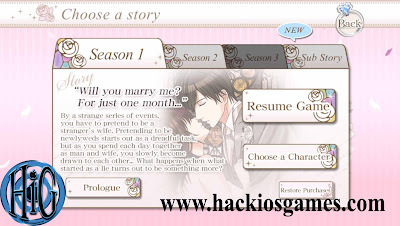 My Forged Wedding hack cheat is a save file - save game, no tools and it's for free no survey, you can download it without surveys. * Put the Downloaded folders in :「User Applications/Wedding/」 using (iFile, iFunBox...) or other apps. * Let it load (do everything the Game tells you to do), then close it from the multitask. * Go to : 「User Applications/Wedding/」 using (iFile,iFunBox...) or other apps. * Delete the files in "Documents" folder & Copy/Past the downloaded ones. * Go to "library" folder then "preferences" Delete the "com.voltage.chkai.en.plist" file & Copy/Past the downloaded one. * Run the game & Let it load. Enjoy!! Don't forget to Like and Share!